The ensuing developments four months later go to show just how wrong a person can be. For more than 10 years now, the “Tribute to Carl Benz” association has made numerous attempts to solve this mystery. Nevertheless, the more that one dealt with this topic, the more apparent it became that the clarification of this question would be of no communal or corporate philosophical relevance, neither at the beginning of the triumphal march of the automobile nor during Benz’s lifetime (who knew just as little about the matter). In addition, solid evidence of serious research does not exist. Every hometown of a comparatively important person from contemporary history usually adorns itself with this historical event anyway – which is best symbolized by the birthplace or the location, at a minimum. On the other hand, a corporation whose reputation is inextricably linked to the name Benz should have an increased interest in the clarification of this remaining “blank spot” in an otherwise conclusively documented corporate history – since the fusion of both Benz and Daimler in 1926, at the latest. With that being said, it surprised me even less that Mannheim and Ladenburg are alternately named as birthplaces. 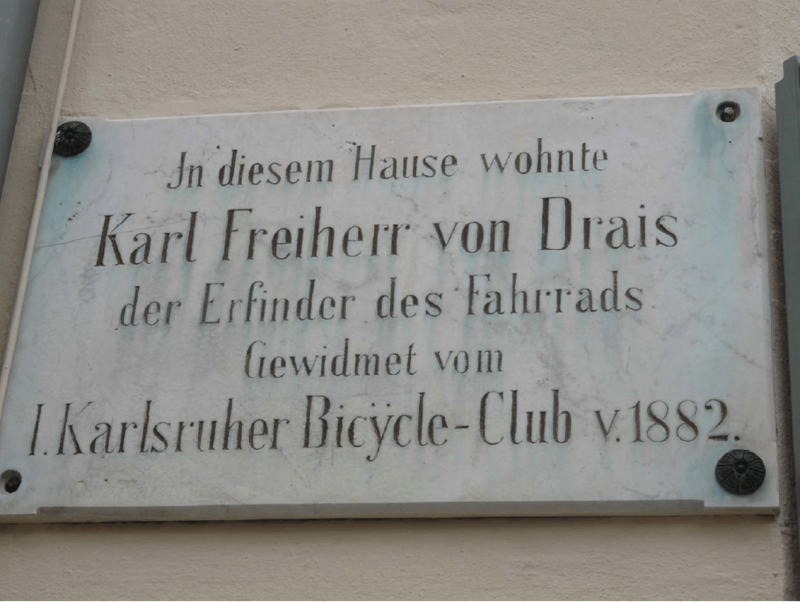 This fact is not even anchored within the collective memories of the natives of Karlsruhe, the automobile pioneer’s true birthplace. In particular, those residents of the western districts (to which the formerly independent municipality Mühlburg belongs to) where a commemorative plaque was mounted for public view by the local civic association in 1933. The plaque itself makes no mention whatsoever that this is in fact true or even assumed in a broader sense. 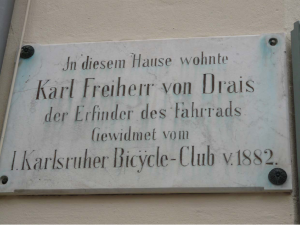 For this reason, it appears less odd that a plaque for the second Karlsruhe pioneer of mobility, Karl Friedrich Freiherr Drais, was incorrectly mounted at Hebelstrasse 4. The correct location is Zähringerstrasse 63. Instead of correcting this proven error, it is tacitly accepted without any objections whatsoever. In light of the preliminary planning for the Automobilsommer 2011, I first contacted the director of the Karlsruhe City Museum, Dr. Pretsch, in early August 2010 to inform him of the results of our activities thus far. Both in terms of an external representation of the relationship Benz to his hometown that lacks refinement, as well as the unsuccessful efforts until now to locate the house where he was born. For the longest time, I had to assume that this building had fallen victim to either the war or extensive urbanization efforts during the 50’s and 60’s. The search inevitably concentrated on its location. A few days later, Dr. Pretsch was able to report a first major success. For the first time, and unlike all previous historians, he elected to research the Mühlburg parish register – with the aim of identifying little Carl’s godfathers. He actually found them – the first one listed was Michael Kramer, innkeeper and brewer in Mühlburg and the second was master shoemaker Karl Axtmann from the then neighboring city of Karlsruhe. 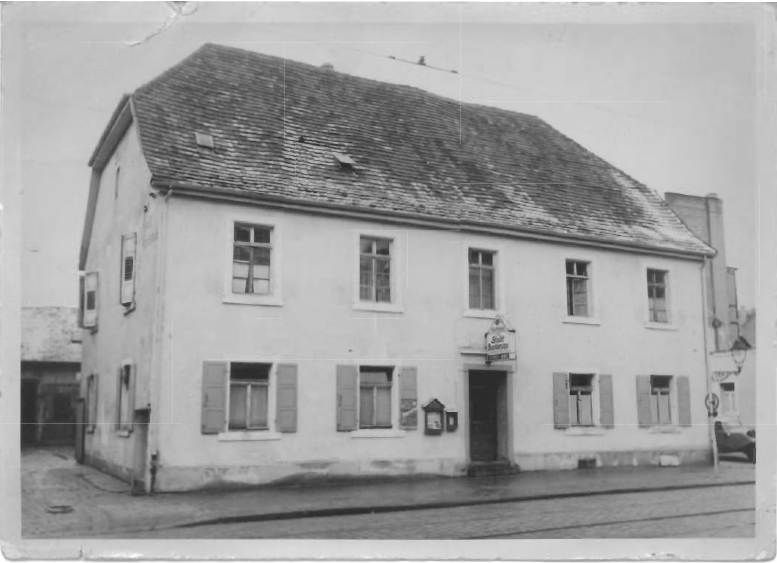 At the same time, Michael Kramer was unequivocally identified as the owner of the “zum Weinsberg” restaurant (later renamed to the “Stadt Karlsruhe” Inn). At that time, the premises were large and spacious compared to other domestic architecture in Mühlburg. Finally – a promising and scientifically sound lead, more than 160 years after the birth of Carl Benz! It is relatively certain that Josephine Benz, née Vaillant, spent the majority of her working life as a maid up until 1844. The servant ordinances of the 19th century bear testimony that the employer is obligated to provide for the welfare of his employees, as well as provide room, board and wages (generally very low wages) in return for the services rendered. This mixture of legal obligation and low pay meant that service personnel and the employer often lived under one roof together with the employer’s family. Subsequently drawing upon the conclusion that Josephine Benz had found shelter with Michael Kramer due to a lack of alternatives and financial possibilities, the Daimler Company archives were informed of these findings in November 2011. At that time, we estimated this theory to be more than 50% correct. It was much too early to speak of a significant breakthrough, however. At best, this could be considered a respectable achievement. This would also explain my skepticism towards this discourse. The following months would show just how justifiable my skepticism was. Even so. We were able to approach the public and inform them of a tangible conjecture, exercising due caution in the process. Dr. Pretsch managed to complement this chain of evidence by the end of February. At the same time, it must be mentioned that in addition to this research, other tasks were waiting to be completed at the City Museum and that the research activities did not focus solely on this topic. This time it was an entry in the Karlsruhe servants directory, where the dismissal of Josephine Vaillant from the services of a merchant family were documented in September 1844, just a few weeks before birth of Carl Benz. After that, there was no trace of her at all up until her marriage in 1845. It can be assumed that the daughter of a Huguenot family, living in the then catholic denominational seat of royal power, would not have been able to give birth to a child fathered by a catholic out of wedlock without suffering certain personal repercussions. The termination of employment could have been a likely result of the given circumstances. As a result, Josephine Benz was forced to disappear. In twofold, what seemed more reasonable than to select the neighboring Protestant dominated Mühlburg district as a hideaway and transitional new home? This would create a whole new set of circumstances, however. A reassessment of this thesis would become necessary if we were to assume, based on the evidence gained thus far, that Josephine Benz had found a new employment opportunity. Which economically minded employer would offer employment to an obviously pregnant woman during that time, especially if he was not obligated to do so in the first place? Not to mention the aggravating concomitant circumstances involved with this. The second godparent’s name, Axtmann, suddenly attained groundbreaking importance near the end of March. My internet research revealed unexpected evidence of a connection between the Benz and Axtmann families. In the Dees family chronicle, whose roots lie in Pfaffenrot, among other places, and from where the Benz family is descended from, it is mentioned that Karl Axtmann was not only a godparent, but also a witness to the marriage of Carl Benz’s parents. I was not aware of the actual explosive force of this discovery at that particular moment. I had become far too euphoric based on apparent evidence that a connection to a godparent had actually existed. In the process, I had forgotten to draw logical conclusions from this fact, as I would normally do otherwise. But not Dr. Pretsch, whom I had immediately informed of my discovery. Consequently, a close relationship had existed between the Benz and Kramer families, where this alliance could be deemed an expression of gratitude for providing accommodations at the time of birth and the first few months afterwards, provided the relationship was not based on an unproven past personal history. This assessment, in my opinion, would have also applied to paid accommodations – most likely funded by the child’s father (Johann) Georg Friedrich Benz or his family. The question that remains open, however, is the crosslink between the witnesses to the baptism and the wedding. It is very unlikely that the artisan Axtmann knew the economically well-situated entrepreneur Kramer from his regular visits to the inn. Time, money and the need for this were missing here. After all, there were a number of localities situated in the immediate city center vicinity of Spitalstraße 38 (Karlsruhe) where Axtmann once lived. The reverse case appeared more feasible. Namely, that Kramer made his way from outlying Mühlburg to pick up a new supply of shoes or repair others. Just as conceivable is information that Axtmann may have received while in a Karlsruhe inn, where a family member or professional colleague was said to reside in Mühlburg, subsequently establishing personal contact to said individuals. A family relationship between Kramer and the Benz family is highly unlikely, however. What we do know since early May, however, is that Carl Benz’s great-grandmother is an Axtmann by birth. This at least closes the open issue concerning the genetic connection between the Benz family and Axtmann. As a result, the historical analysis is not entirely complete. And who knows what other surprises lie in store for us. Be that as it may – we would still be at an 1844 level of intelligence in this regard without the high degree of commitment and professionalism exhibited by Dr. Pretsch and his scientific research assistant, Mr. Meinrad Welker. I wish to extend my sincere gratitude that this is not the case!